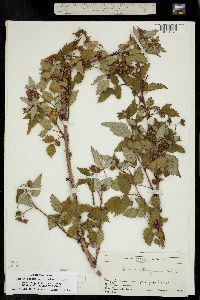 PLANT: Young stems, petioles, and inflorescences with minute eglandular hairs, gland‑tipped prickles to ca. 2 mm long, and stipitate glands. 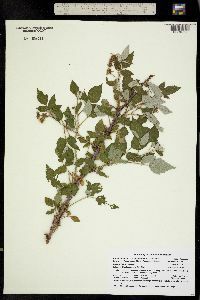 LEAVES: grayish‑tomentose below. 2n = 14 (and polyploids). NOTES: See also parent taxon. Pine, fir, and spruce forests often in wet or rocky places: Apache, Cochise, Coconino, Gila, Graham, Greenlee, Pima, Yavapai cos.; 1850‑3500 m (6000‑11500 ft); (May-)Jun‑Aug(-Sep); widespread in cooler parts of N. Amer. extending s into OR, IA, NC; n Mex. REFERENCES: Brasher, Jeffrey W. 2001. 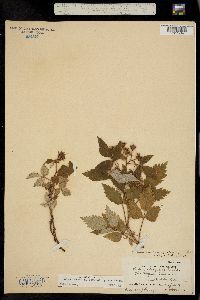 Rosaceae. J. Ariz. - Nev. Acad. Sci. Volume 33(1). 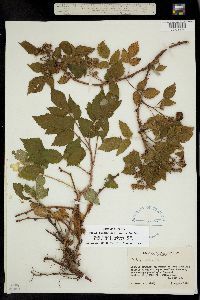 Similar species: Page is under construction. 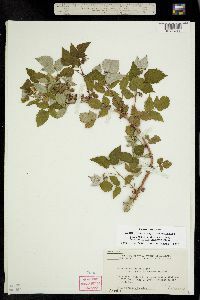 Please see link below for general information on the genus Rubus. Habitat and ecology: Locally common in disturbed peaty or boggy areas, swampy woodlands, and springy places. 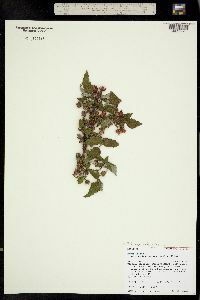 Etymology: Rubus is the Latin name for bramble and also means red. Idaeus means "from from Mt. Ida of ancient Greece." Strigosus means "with bristles." Found throughout the lake area, sometimes covering large peat areas that have just passed out of the tamarack and marsh stages into the soft maple and white elm stages. 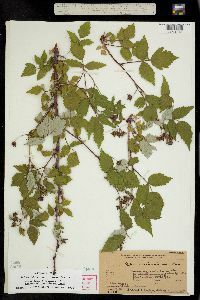 I have this [pubescent] form of the red raspberry from only four [northern tier] counties where it was found in tamarack bogs and moist, mucky soil.